Imagine you're on your way to a crucial job interview. You're stuck in traffic and worried you'll miss the appointment. You can't take an alternate route, and time is ticking. If you could see your cells, you would realize that your body is most likely responding by releasing cortisol, a "stress hormone." Stressful situations, lack of sleep, and even busy lifestyles can elevate cortisol levels in your body. However, when cortisol levels stay high for long periods of time, it can have a negative effect on your health. Fortunately, you can easily and naturally lower your levels of this stress hormone. Cortisol is a stress hormone that plays a role in your body's fight-or-flight response, which is how your body reacts to stress or threats. When you're in danger, your body prepares to either stay and "fight" or run away and "flee." In prehistoric times, the fight-or-flight response was crucial for our ancestors to survive attacks from enemies or animals. But you don't have to be in a jungle fighting tigers to feel ongoing stress. Our bodies have similar reactions to less life-threatening issues, like stressful meetings at work or arguments with loved ones. A daily, busy lifestyle alone may lead to high cortisol levels. Cortisol affects many parts of your body. It increases your heart rate, blood pressure, breathing rate, muscle tension, and blood sugar levels. This is why your heart pounds, you sweat, and experience heavy breathing when you're in a stressful situation. Cortisol levels can vary based on gender, age, health history, and time of day. In general, your cortisol levels are higher in the morning and decrease as the day progresses. Its levels are lowest at midnight. From 6 a.m. to 8 a.m., normal levels range from 10 to 20 micrograms per deciliter (mcg/dL). Around 4 p.m., normal levels range from 3 to 10 mcg/dL. All this can change with daily stress. Your adrenal glands, hypothalamus, and pituitary glands control cortisol levels in your body. Together, they form what scientists call the "hypothalamic–pituitary–adrenal axis." High cortisol levels can lead to a variety of symptoms. Too much cortisol has a negative effect on your health, and continued exposure may lead to what doctors call Cushing's syndrome (also called hypercortisolism). Cushing's typically leads to weight gain around the mid-section, face, and upper back, with weight loss from legs. If you're wondering how to lower cortisol levels, relatively simple lifestyle and diet changes can help. 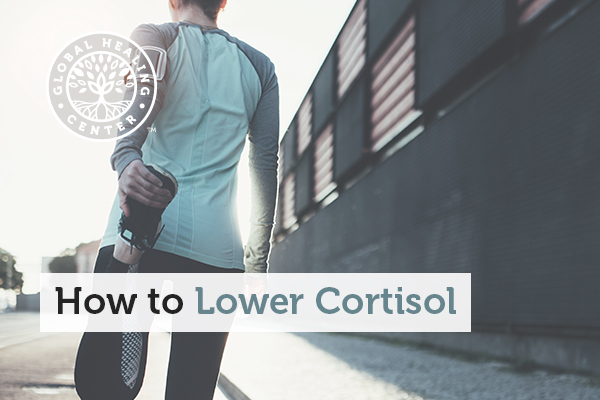 In addition, specific supplements and herbs may also normalize cortisol levels. Below, we've listed several natural options. The incredible array of healthy antioxidants you get from eating this way helps reduce both physical stress within your body ("oxidative stress") and emotional stress — both of which influence cortisol. There is also a specific anti-inflammatory diet you can follow. Try stress-relieving foods, including dark chocolate, walnuts, avocado, garlic, figs, Swiss chard, dulse seaweed, citrus fruits, and pumpkin seeds (which are also rich in amino acids). Avoid dehydration — which can raise cortisol — by drinking plenty of water. Also, consider drinking green tea because experts believe it lowers cortisol. One of the most important ways to lower cortisol involves healthfully managing your stress. Consider deep breathing exercises or focusing your mind on a soothing word when you begin to feel stressed. Some people like to visualize tranquil scenes and practice being happy in their mind's eye. For more ideas, check out Dr. Group's Recommendations for Stress Management article. 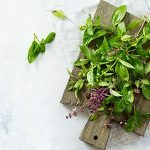 Holy Basil: Don't confuse this green leafy plant with sweet basil used for cooking, a related but different plant. Holy basil, or tulsi, fights free radicals in the body, boosts the immune system, and improves your mood. Ginseng: This herb has many therapeutic properties. Studies show that ginseng positively impacts brain health, lowers stress, and boosts energy. 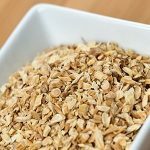 Rhodiola: This flowering plant helps increase energy levels, and, as an antioxidant, it also helps the body resist physical, chemical, and emotional stressors. When people took Rhodiola daily, they reported less anxiety and stress. Earthing or grounding refers to having direct contact with our planet's surface, which can help your body better manage stress. When 60 people slept on conductive carbon fiber mattress pads, which helped ground their bodies to the earth, they reported falling asleep faster, having more energy, and experiencing less pain. Omega-3 Fatty Acids: Found in flax, algae oil, hemp seeds, and other foods, omega-3 fatty acids can help with mental stress. In one study, participants who took omega-3s every day for three weeks had lower cortisol levels. Lithium Orotate: This alkali metal can calm your mind, bring clarity to your thoughts, and boost overall mental wellness. One study found that people who took lithium orotate daily reported feeling happier and less down. Vitamin C: Found in citrus fruits and other produce, vitamin C is an antioxidant. When people took vitamin C daily, they had lower cortisol levels after exercise, particularly running. Magnesium & B Vitamins: These important nutrients play a role in many body processes. One study found that combining magnesium and B vitamins reduced stress and cortisol levels, especially premenstrual anxiety. The same benefit did not occur when either magnesium or B vitamins were taken without the other. Probiotics: The gut is connected to the mind, and a healthy gut with a thriving microbiota of beneficial bacteria goes a long way towards lowering stress. You can try fermented foods or a probiotic supplement. Not only does physical activity benefit the body and improve health, but it can also help you manage cortisol levels. Aerobic exercise can improve your sleep and mental health. Studies show that physical activity also reduces daily stress. I recommend trying tai chi if you can't do strenuous physical exercise like aerobics. Some fun ideas include dancing, swimming, running, biking, hiking, and walking. When you're under stress, your body releases cortisol. Too much of this stress hormone can hurt your health. High cortisol symptoms can range from weight gain to muscle weakness. However, there are natural ways to manage it — from meditation to yoga to adaptogenic herbs. The most important step to lowering cortisol is managing stress in your life, because the two go hand in hand. I recommend eating a healthy, plant-based diet, finding ways to relax, exercising, and having fun. You may also want to try supplements like holy basil, lithium orotate, or omega-3 fatty acids. Getting enough sleep, staying grounded to the earth, meditation, yoga, and aerobic exercises can also help you manage stress. Do you have other methods to lower cortisol levels? Please share with us and our community! Stress System Malfunction Could Lead to Serious, Life Threatening Disease. Eunice Kennedy Shriver National Institute of Child Health and Human Development, National Institutes of Health. Updated 9 Sep 2002. Accessed 11 Dec 2018. Cortisol (Blood). University of Rochester Medical Center Health Encyclopedia. Updated 9 Sep 2002. Accessed 11 Dec 2018. Lovallo WR, et al. Caffeine stimulation of cortisol secretion across the waking hours in relation to caffeine intake levels. Psychosom Med. 2005;67(5):734-739. Hertel J, et al. Evidence for stress-like alterations in the HPA-axis in women taking oral contraceptives. Sci Rep. 2017;7(1):14111. Cushing's Syndrome. National Institute of Diabetes and Digestive and Kidney Diseases, National Institutes of Health. Updated May 2018. Accessed 11 Dec 2018. Alghadir AH, Gabr SA. Physical activity and environmental influences on adrenal fatigue of Saudi adults: biochemical analysis and questionnaire survey. J Phys Ther Sci. 2015;27(7):2045-2051. Yau YHC, Potenza MN. Stress and eating behaviors. Minerva Endocrinol. 2013;38(3):255-267. Hintzpeter J, et al. Green tea and one of its constituents, epigallocatechine-3-gallate, are potent inhibitors of human 11β-hydroxysteroid dehydrogenase type 1. PLoS One. 2014;9(1):e84468. Chandrasekhar K, et al. A prospective, randomized double-blind, placebo-controlled study of safety and efficacy of a high-concentration full-spectrum extract of ashwagandha root in reducing stress and anxiety in adults. Indian J Psychol Med. 2012;34(3):255-262. Jamshidi N, Cohen MM. The clinical efficacy and safety of tulsi in humans: a systematic review of the literature. Evid Based Complement Alternat Med. 2017;2017:9217567. Kim E-H, et al. Anti-oxidative stress effect of red ginseng in the brain is mediated by peptidyl arginine deiminase type IV (PADI4) repression via estrogen receptor (ER) beta up-regulation. J Ethnopharmacol. 2013;148:474–485. Cropley M, et al. The effects of Rhodiola rosea L. extract on anxiety, stress, cognition and other mood symptoms. Phytother Res. 2015;29(12):1934-1939. Leproult R, et al. Sleep loss results in an elevation of cortisol levels the next evening. Sleep. 1997;20(10):865-870. Chevalier G, et al. Earthing: health implications of reconnecting the human body to the Earth's surface electrons. J Environ Public Health. 2012;2012:291541. Turakitwanakan W, et al. Effects of mindfulness meditation on serum cortisol of medical students. J Med Assoc Thai. 2013;96 Suppl 1:S90-5. Grosso G, et al. Omega-3 fatty acids and depression: scientific evidence and biological mechanisms. Oxid Med Cell Longev. 2014;2014:313570. Lakhan SE, Vieira KF. Nutritional therapies for mental disorders. Nutr J. 2008;7:2. Peters EM, et al. Vitamin C supplementation attenuates the increases in circulating cortisol, adrenaline and anti-inflammatory polypeptides following ultramarathon running. Int J Sports Med. 2001;22(7):537-543. McCabe D, et al. The impact of essential fatty acid, B vitamins, vitamin C, magnesium and zinc supplementation on stress levels in women: a systematic review. JBI Database System Rev Implement Rep. 2017;15(2):402-453. Hamer M, et al. Physical activity, stress reduction, and mood: insight into immunological mechanisms. Methods Mol Biol. 2012;934:89-102.